We’ve spent the last month tightening the bolts on the servers with the latest patch improving stability and we’ve added a number of exciting new features to the client. Controller support is in we’re pleased to say and it adds such a cool dimension to the game. It's pretty fun with the mouse and keyboard but when played with the joypad it's almost like a different genre of game. We're looking forward to adding some more action based components like sprinting to compliment it. Following the same standard most games adopt these days, controller hints are shown only if a controller is detected. 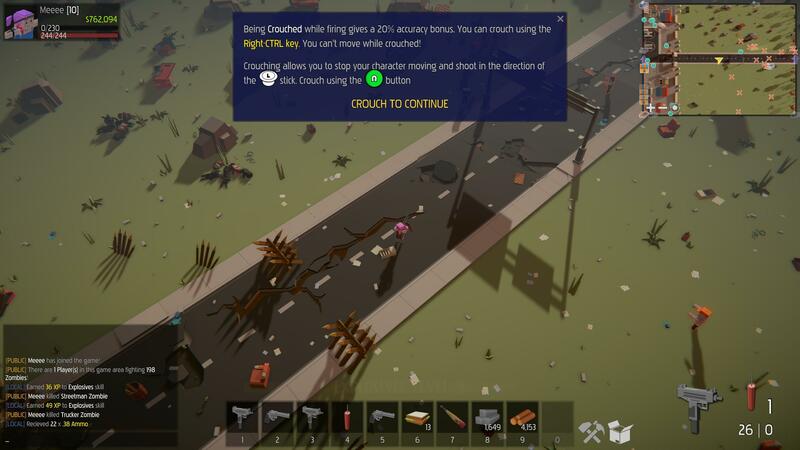 We’re calling it ‘partial’ support right now because we still haven’t added controlling the menus or inventory via the controller, all this will be coming very soon. 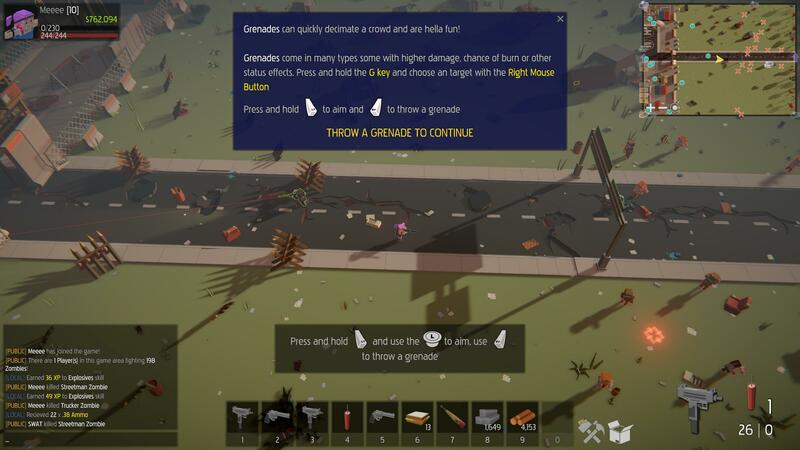 To tidy things up and make things flow a little better, the grenade throwing experience has been updated so it makes a little more sense. Grenades have a minimum and maximum throw range and there’s a little bit of trickery with the camera now to help you aim. 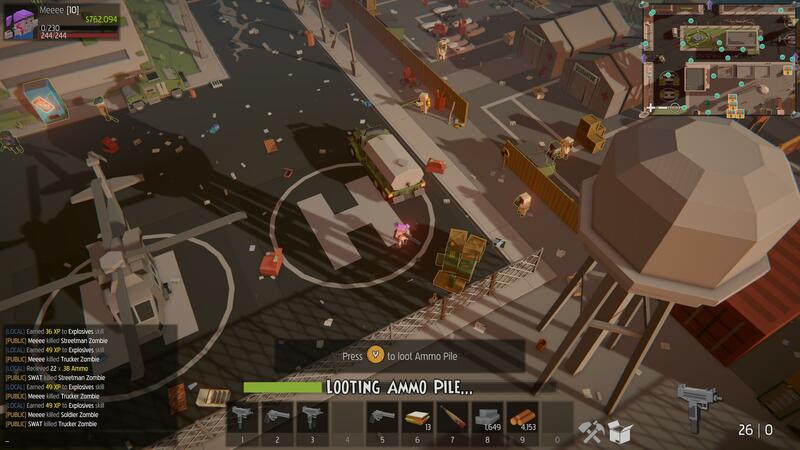 What’s more, you can now loot resources and stash piles by silently clicking on them when you are near, kinda makes more sense than having to shoot the place up to extract a sandwich from a vending machine – although, you can still do that if you wanna. You asked for it and it is here folks, a full tutorial! We had to wait until we added controller support else we would have been chasing our tail, but we now have a 30-step tutorial taking us though all the controls of Zombie Barricades and you’ll hopefully be an expert once you’ve completed it. 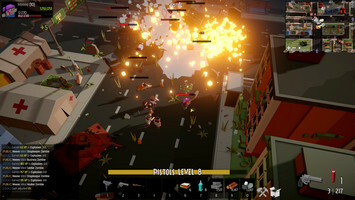 The dream was to create a game that was free for people to play and leave it to you to decide whether to contribute. We planned to do this via a F2P model – but it quickly became apparent this was going to compromise some of the game mechanics and this is important, because if we have to purposely break parts of the game to sell more in-game stuff then that isn’t cool. Plus, when we mention ‘F2P’ people seem to visibly tense up, no matter how pure the intention. But we know we have something fun to play because the feedback has been positive, with many of you surprised at just how far we’ve come. We just need to change the model to make the game even better. 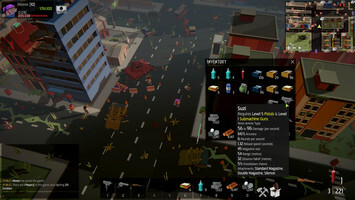 It’s been really great getting the feedback from the community and building something tight from the very start but servers cost money to run, the services we need to use to provide you the game have a cost and people ultimately need feeding. As such we’ve decided to release on Steams Early Access and are proud to announce the coming soon is up! We anticipate we’ll keep the game free for a while yet though don’t worry and we have some cool stuff indeed waiting to added. So, we boldly venture forth toward getting ready for Steam - still some very cool stuff to be added in the interim so it's worth playing the alpha for free in the meantime! Look forward to the introduction of mission and quests, the first interior ‘the infested Hospital’ and we’ll start taking down the F2P boundaries and rolling in the some of the more traditional stuff that’s lacking such as se. items etc. Thanks for the support and you’ll be hearing from us again real soon!